EasyMeasure® shows you the distance to objects seen through the camera lens of your iPhone, iPad or Android device. Simply aim your device to any object in your surroundings, and EasyMeasure displays the distance towards that object on top of the camera image. With its amazing 3D camera overlay grid, using EasyMeasure is very intuitive and easy! Find out how far it is towards that boat at the other side of the lake. Measure how tall buildings are. Use the app as a golf-aid. Measure your friend's height (and width :P). The possibilities are endless! How does it work? 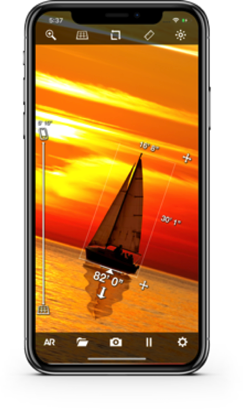 EasyMeasure uses the height of the camera lens (determined automatically by AR in iOS11) and its tilt angle to calculate the distance to the object. A comprehensive animated tutorial on how to use EasyMeasure is included. -Measures distance. Can be updated to measure the height and width of objects! -Includes the possibility to calibrate your iPhone/iPad for most accurate results! -Make a snapshot of the image with the distance and store it in the photo album for later use. -Supports Metric and Imperial units. EasyMeasure is available in 6 languages: English, Dutch, Spanish, Portuguese, Italian and French! EasyMeasure is available for iOS and Android! Check out our blog post about the critical input quantity of an augmented reality app! When you are a developer, check out our EasyMeasure API ARView for integrating the EasyMeasure Augmented Reality View into your application (iOS only)! 5 Apps That Make You Say Wow!